Bulb mites infest the bulbs of many plant species among them; lilies, onions, tulip, hyacinth and many other vegetable crops, cereals and ornamentals. They can occur in the field during growing and in storage after harvest. Adult bulb mites are pearly white with reddish-brown mouth parts and short red legs. Females are approximately 1mm long and produce between 100-150 eggs, laid singly or in groups on the surface of the bulbs, mostly near injured or decaying tissue or between bulb scales. The male is usually very small to see without a magnifying hand lense. Bulb mites are most active when the humidity is high and the temperature is between 15°C and 27°C. They become inactive at temperatures below 10°C and above 32°C. A life cycle can be completed in 14-17 days at 27-30°C. Bulb mites go through an egg, larval stage, two nymphal stages and an adult stage, an additional nymphal stage called hypopus can occur due to overcrowding. The bulb mite in this stage is minute, eight-legged, oval and does not feed. It is well adapted to withstand unfavorable environmental conditions. 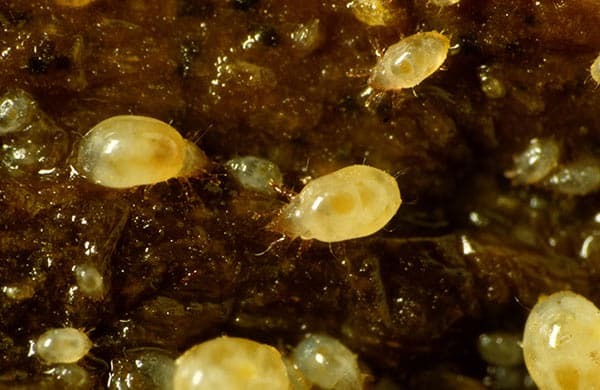 Hypopus is the most active stage of the bulb mites and is able to wander about and can be carried to considerable distances by attaching itself to objects and to insects such as flies, thrips, fungus gnat, or shore flies visiting rotting bulbs. The hypopus stage may last up to 14 days and when a suitable host plant is found, it molts into the 2nd nymphal stage, which in turn molts into the adult. The females may live for about 30 days, while the males dies soon after mating. Bulb mites feed on the underground parts of bulbs, weakening the plant tissues. Feeding scars predispose the bulbs to secondary infection by plant pathogens such as Fusarium, Pythium, and Rhizoctonia. Typical symptoms include rosetting, retarded growth, chlorosis of new shoots and occasionally the new growth can be smothered to death. Flower stalks can be stunted or fail to develop all together. Bulb mites are difficult to observe until their damage becomes apparent.